Free Texas beer! Free tacos! And I, along with the fine folks at the Microsoft IE9 team will be out in full force, talking up the upcoming IE9, which is chock full of HTML5 goodness. 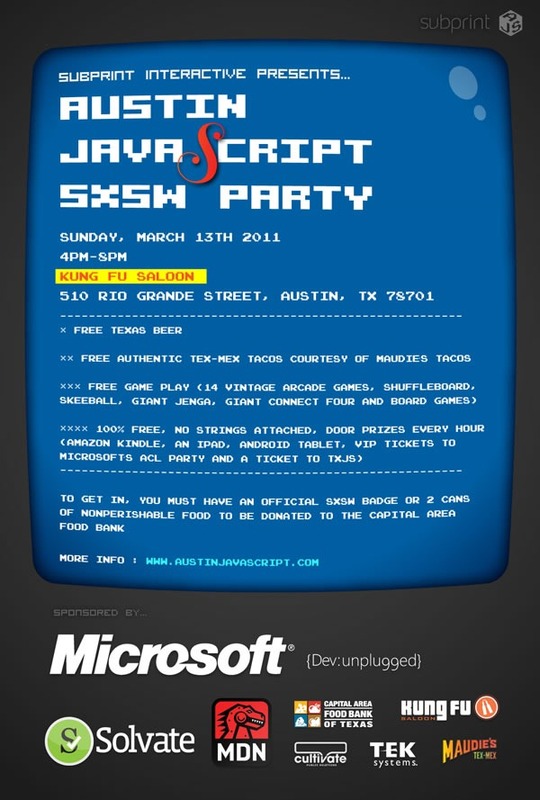 If you’re in Austin, please drop by! 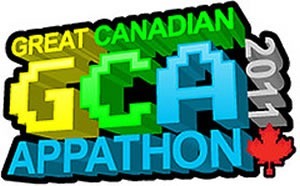 The Great Canadian Appathon, the 48-hour cross-Canada mobile game coding marathon, takes place this weekend! In fact, as I write this, it’s been under way for about half an hour. There’s still time for you to register – if you’re keen to write apps this weekend and win prizes and recognition, it’s not too late for you to register and start coding! There’ll be coding events taking place on university campuses across the country, and if you’re not near one of them, you can also work in the comfort of your own home, favourite wifi-enabled coffee shop, wherever! 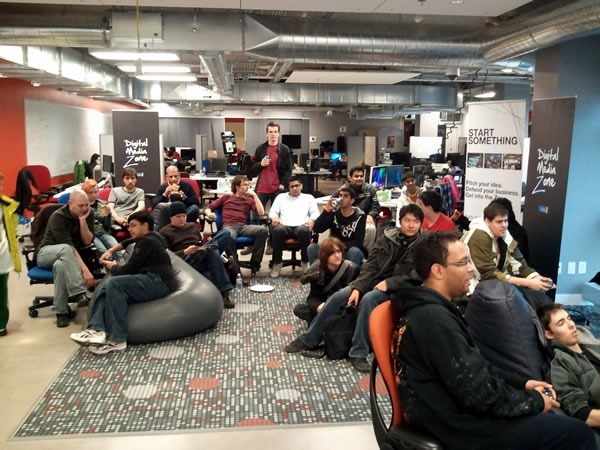 The Great Canadian Appathon is organized by the National Post and Toronto-based mobile game development shop XMG, and we’re the official platform sponsors. The National Post’s business news wing, the Financial Post, had their podcasters Matt Hartley and Jameson Berkow chat with Gladstone Grant, my boss’ boss’ (or, as we say in Microsoft parlance, my “skip-level manager”). It’s been captured in a podcast, in which Gladstone talks about the Windows Phone 7 platform, developer uptake, the Nokia deal and more. Also in the podcast: a panel discussion with XMG founder Ray Sharma, Dan Page of Telus (one of the sponsors) and Winnie Leung of KPMG (another Appathon sponsor). 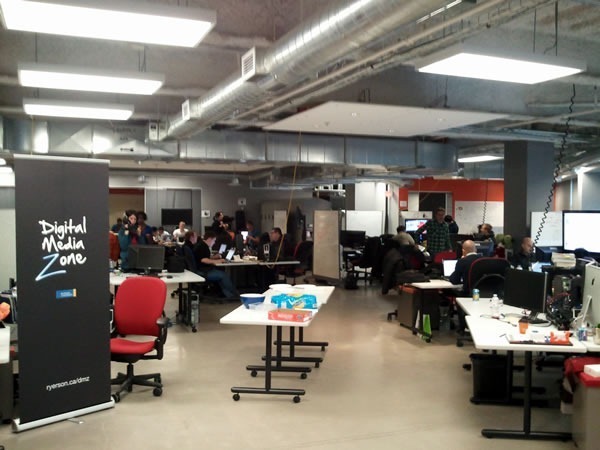 I spent a good chunk of last Friday and Saturday at Ryerson University’s Digital Media Zone (DMZ), an incubator for Ryerson students and alumni who want to get their first taste of tech entrepreneurship. 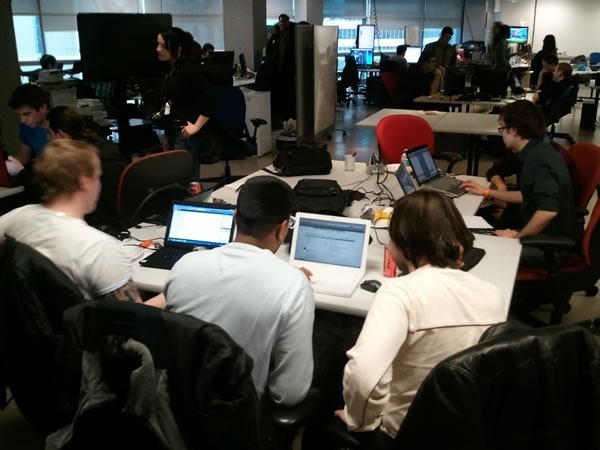 I was there – along with some help from RedBit Development and ObjectSharp — to help out at a Windows Phone 7 Code-a-thon, where students from all over the greater Toronto area were challenged to think up and build a Windows Phone 7 app in a mere 24 hours. The event started at noon last Friday with me doing a quick presentation on Windows Phone development, sending the students to App Hub, explaining the Visual Studio 2010 Express for Windows Phone IDE and walking them through a very quick “Hello, World!” example. After that, it was time to unleash them on the machines. The students split up into teams. Some worked solo, while others formed groups. We provided technical help, snacks and energy drinks, the students took all that and started converting it into software. A good number of them stayed in the DMZ overnight, working away on their code. I left at around 10 p.m. and returned 12 hours later to find them still hard at work. While walking around, I asked the students about their programming experience. Some had worked with C# before, but many hadn’t. 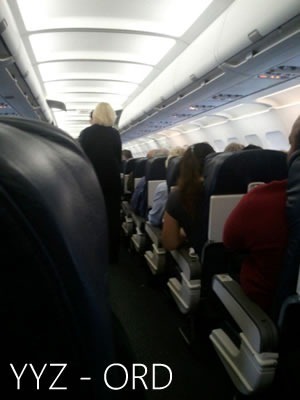 Still, they were able to get up to speed fairly quickly, and I and the other advisors were able to quickly able to resolve most of the problems they brought to us. I don’t think you could get up and running that quickly if you were doing this in Objective-C.
At about 2:00 p.m., we started calling in each team to show us their app. We were pretty impressed by both their creativity as well as their progress; in a mere 24 hours, the teams had come up with imaginative app ideas and fairly complete applications. Some teams finished early and decided to create (and submit) a second application! I saw a lot of great apps (over a dozen were submitted in the end), but we had to narrow it down to a single winner, and that winner was Andrei Borodin, who wrote a Phone version of the Russian card game Durak (“Fool”), which he enhanced by adding a side-betting system. As the winner, we gave Andrei a brand new Samsung Focus Windows Phone 7 device, which we hope he’ll use to continue developing Windows Phone 7 apps. We also gave the DMZ their very own Samsung Focus so that other students and alumni there can build apps. 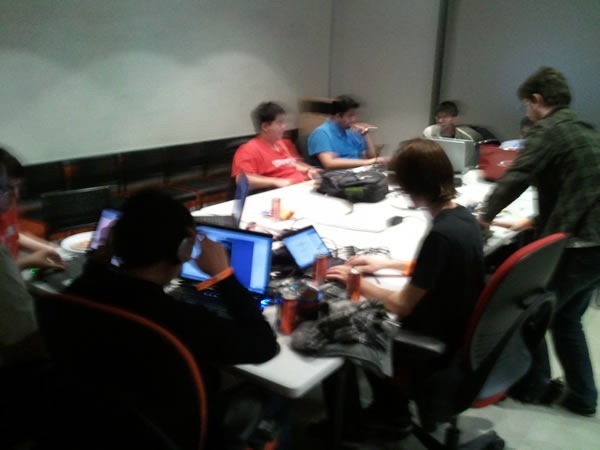 This was the second student Code-a-Thon we’ve held for Windows Phone 7, and judging from the success, I can expect to see (and help out at) a few more this year. Hopefully, these students will continue to explore Windows Phone 7 development and put out some great apps! The event was covered by the Ryerson University student paper the Eyeopener, and you can check out the article here. I’ll write more in a later post. The South by Southwest (SxSW) conference may have started off as a music festival – and it still is; if you want to see up-and-coming bands before anyone else hears about them, this is the place – but it’s grown to include the film and interactive sections. I’ve been told that nowadays, the Interactive part of the conference is larger than Music and Film. It was at SxSW that Twitter and later, Foursquare, exploded onto the scene, when A-list bloggers started making use of it to find each other and locate the happening parties. I’ve seen some of the best and most inspiring presentations at SxSW, from Kathy Sierra talking about creating apps so great that your users become passionate about them to the creator of the Post Secret talking about building a site that tugs at your heartstrings to Ben Huh explaining how I Can Haz Cheezburger got started, and handing out cheeseburgers to everyone in the audience at the end of the session. I watched the entertaining but cringeworthy keynote with Sarah Lacy interviewing Mark Zuckerburg during which they weren’t clicking. I’ve had amazing between-sessions conversations with developers, designers and “suits” about their projects, technologies that they were excited about and the industry in general. 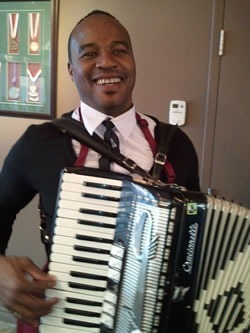 And yes, I may have attended a party of two. While there’s a lot that you can learn online, there’s a reason the expression “you had to be there” exists. For all the world-shrinking tech that lets us send words, sounds, pictures and videos over great distances and lets us attend meetings just with a headset and webcam, there’s still no substitute for gathering together to tell stories, share ideas and even team up. That’s why we go to great expense to hold events like TechDays and AlignIT as well as smaller gatherings like hackathons and Coffee and Codes. As the “agilistas” will tell you, developing software is as much about talking to people as it is about talking to machines. That’s one of the reasons I’m at South by Southwest for the next seven days. I’m there to catch up with some of the brightest lights in the world of interactive tech, hear what they have to say, pick their brains and share this knowledge with you. I’ll be filing reports from the conference, taking notes, pictures and video, so you can see what’s going on. Whenever I can, I’ll also be sharing Canadian developers’ stories. SxSW is one of the big tech conferences, so many Canadian developers and startups make it a point to come here every year to make sure they’re on top of what’s going on in the industry, as well as to be seen and heard. If you have the time and the funds, I recommend coming down to SxSW and experiencing the sessions, the collective brainpower, the vibe, and yes, the partying. All work and no play makes you a dull developer, after all. Keep an eye on this blog for my reports from South by Southwest! I promise you’ll be informed and entertained. The Great Canadian Appathon is This Weekend! Are you a Canadian post-secondary student? Do you think you (or better still, you and a team of your fellow students) whip up a mobile game in 48 hours? Are you looking for something to do this weekend, something where you could end up with a published app, some fame and prizes? 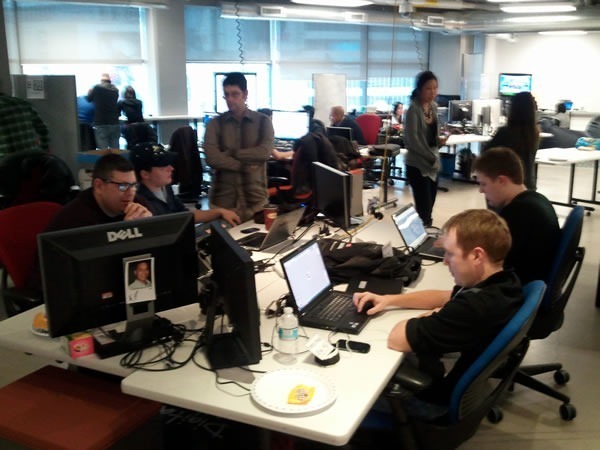 Then the Great Canadian Appathon, which takes place this weekend, is right up your alley. Toronto-based mobile game shop XMG Studio, along with the National Post, Telus and KPMG are holding this event. As the folks behind the phone with what I believe to be the easiest development frameworks for apps and games – Windows Phone 7 with Silverlight and XNA – we’ve stepped up and are the official platform sponsor of the Great Canadian Appathon. The Appathon isn’t just about building a great game, but also doing so within a limited timeframe. Competing teams can’t start developing until Friday, March 11th at 5:00 p.m. Eastern and are working towards a deadline set at 48 hours later: Sunday, March 13th at 5:00 p.m. Eastern. Teams can be up to 4 students and can compete either at specific Appathon venues located in several colleges and universities across Canada (which will be providing the appropriate hacker food and energy drinks) or in the comfort of their own room. The importance of participating in competitions like the Appathon is greater than you might think. For starters, participating in such an exercise will help bring you closer to the 10,000 hours you need to become an expert in software development (if you’re not familiar with the 10,000 Hour Rule, you should read Malcolm Gladwell’s Outliers). The time constraint will be a challenge, but things like that will help give you the necessary experience to handle the sorts of stressful situations that you’ll encounter in the working world. There’s also the matter of prizes. And finally, contests are a great way to get noticed by potential employers, even if you don’t place first, second or third. Kristan “Krispy” Uccelo, a friend of mine, placed 4th in a node.js contest and was contacted by Google – he’s got a pretty nice job with them now. If you’d like to participate in the Great Canadian Appathon, your team should sign up by 5:00 p.m. this Friday, March 11th. And may we suggest that you build a game for Windows Phone 7? App Hub. This is the first place you should go if you’re getting started with Windows Phone 7. You can download the developer tools here, along with tutorials, example code and more. Programming Windows Phone 7 ebook. Charles Petzold, the guy who literally wrote the book on Windows development, has put together a great FREE ebook on Windows Phone development, and it does a great and very thorough job of covering both Silverlight and XNA frameworks. C# Yellow Book 2010 and Windows Phone 7 Blue Book. If you’re new to the C# programming language, worry not! It’s easily picked up by anyone who’s worked with an object-oriented programming language, and author and computer programming instructor Rob Miles has made it even easier with the C# 2010 Yellow Book, which is free. Also free is his Windows Phone 7 Blue Book, the perfect companion for the Yellow Book. Internet Explorer 9 and Windows Phone 7 are two Microsoft technologies that have taken a lot of people by surprise. People expected them to be mere incremental releases rather than what they were: complete re-thinks of their predecessors. IE9 brought serious web standards compliance and hardware acceleration to Internet Explorer, and WP7 was a complete from-the-ground-up reworking of the way we did phones. For many people, IE9 and WP7 are terra incognita – unknown territory – and we’d like to help you navigate it.